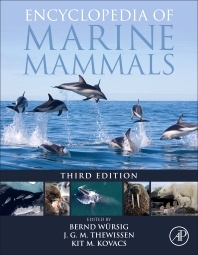 The Encyclopedia of Marine Mammals, Third Edition covers the ecology, behavior, conservation, evolution, form and function of whales, dolphins, seals, sea lions, manatees, dugongs, otters and polar bears. This edition provides new content on anthropogenic concerns, latest information on emerging threats such as ocean noise, and impacts of climate change. With authors and editors who are world experts, this new edition is a critical resource for all who are interested in marine mammals, especially upper level undergraduate and graduate students, researchers, and managers, and is a top reference for those in related fields, from oceanographers to environmental scientists.